The Wellness Agenda – Ripple or Wave? 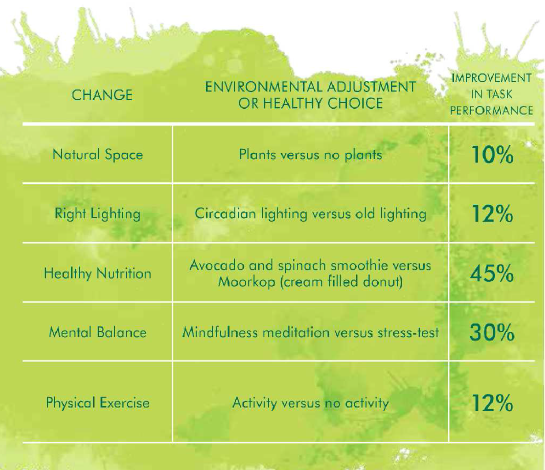 Occupiers are putting employee wellness firmly at the centre of their business strategies. We examine the potential benefits and assess the likely longevity of this movement. Improved employee performance from a variety of wellness-enhancing features. Wellness. Wellbeing. Healthy. Words that ten or even as recently as five years ago were rarely used in the context of real estate. Fast forward to 2018 and – along with technology and innovation -- the wellness agenda is taking centre-stage. Occupiers are starting to place employee wellness at the centre of their business strategies and at the same time the real estate industry is eager to demonstrate the benefits of healthy buildings. As consultants introducing a new, unfamiliar, and possibly ephemeral concept to our clients, we are frequently and rightly challenged to justify the occupier wellness agenda. The questions are technical, varied and novel, reflecting our diverse client base, but two stand out as constants; show me the business case proof for it, and is it really here to stay? A “healthy space” is an ambiguous term, and often undefined. Even the language around it sounds exotic with its talk of ‘circadian lighting’, ‘biophilia’, and ‘active design’; all great buzzwords that, in practice, are often not understood. For us “healthy space” must protect but also actively enhance the wellbeing of the people that use it, and that’s something achieved through both design and operation. It should integrate wellness-enhancing features which subtly facilitate healthier, more productive working habits and experiences. In 2016, we embarked on CBRE Healthy Offices; a pioneering multidisciplinary research programme conducted in partnership with the University of Twente. Completed over 7 months and gathering more than 100,000 data points, this was ground-breaking for the industry. We finally confirmed and quantified, through objective measurement, the causal effect of healthy office adjustments on the ability of employees to perform, in a real office environment. Next up, earlier this year, CBRE-Lab looked again at the impact of healthy spaces on productivity, but this time brought the education of users into the mix. The result? Productivity increased by more than 60% when a nature-inspired workplace was combined with user training, physical activity and mindfulness exercises. Impressively, we were also able to demonstrate a financial return of 70% in the first year. So, is wellness here today gone tomorrow? There is a genuine concern that wellness will be a moment in time on the real estate agenda. Without clear purpose and momentum, it risks being seen as something superficial or simply of the moment, reduced to no more than bean bags, bouncy castles and indoor slides. Firstly, the productivity gains – we can now see a clear, causal relationship between space quality and performance, and corporate businesses are reacting accordingly. Secondly, the war for talent. UK unemployment is at a 40-year low so attracting and retaining top talent is becoming increasingly difficult for businesses. Then there is measurement, which will shortly become commonplace. Employees now have more information on the quality of their workplaces than ever before. We can now monitor environmental quality through our phones! The market is demanding healthy workplaces too – our research demonstrates that. In 2018, 92% of European occupiers prefer wellness-enabled buildings, up from 72% the previous year. Fifthly, wellbeing is now a wider cultural megatrend – the wellness industry is one of the fastest growing industries in the world right now, and fitness is currently deemed the "fastest growing business sector" in the UK. We are experiencing a cultural shift toward healthier lifestyles, which further catalyses the healthy real estate conversation. There’s no question therefore about the business case for wellness and equally, no doubt it’s here to stay. If you’d like to continue the conversation, feel free to get in touch.